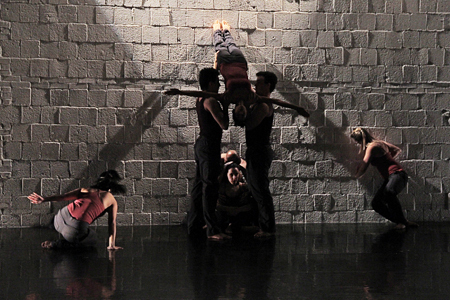 In Back to the Wall, ClancyWorks dancers face the wall as an opportunity as opposed to an obstacle. In a point in history where hope and optimism is a need for survival, the dancers will mount and partner with the wall in physically interesting and visually pleasing ways, “with no harnesses or apparatuses – just strong physical partnering” (Lisa Traiger). In this work, the wall comes alive and offers solutions to challenges – when ClancyWorks sees a wall we don’t run away, we figure out how to transform the obstacle into an opportunity. Back to the Wall has received numerous awards including a Metro DC Dance Award (2002) and choreographic fellowships from the Arts and Humanities Council of Montgomery County and the Maryland State Arts Council. Back to the Wall is a ClancyWorks repetiore dance that is often invited to be restaged for audiences across the country. Back to the Wall from ClancyWorks on Vimeo.